Never touch your pets again! Todd Lawson's Pet Petter is the perfect gift for the dog/cat/horse/sheep lover on your list. 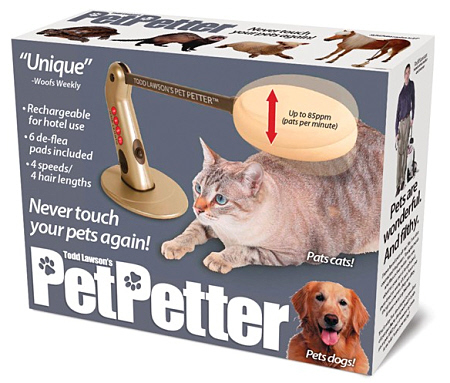 The Pet Petter is an automatic petting device that has 4 different speeds for all types of hair lengths, is rechargeable for hotel use and includes 6 de-flea pads! If you don't want to touch your pet you shouldn't have one in the first place. I've seen several versions of these contraptions, but no evidence that the animals actually prefer them over human touch or respond to them in any way.